Boho Bliss Getaway Byron style. 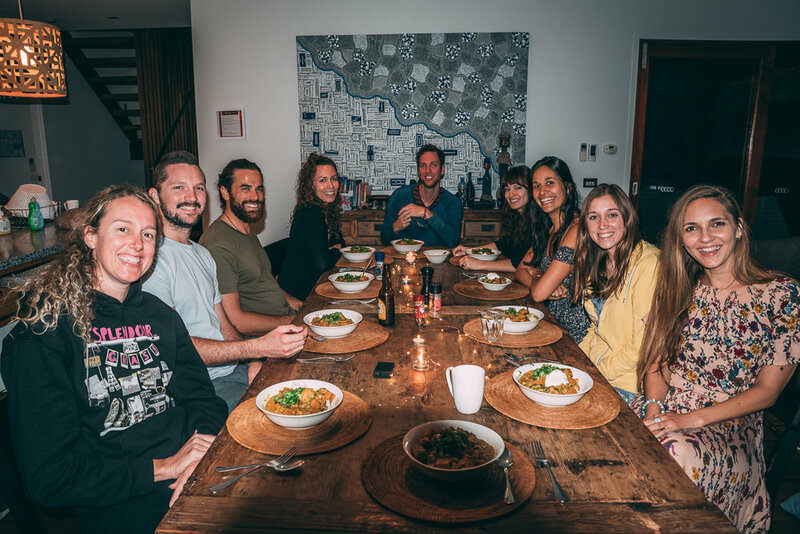 For 3 nights in October Che Johnston & I welcomed a group of wonderful humans to Byron Bay to settle in and soak up the magic of Boho Bliss: An Adventure + Wellness + Connection Getaway. 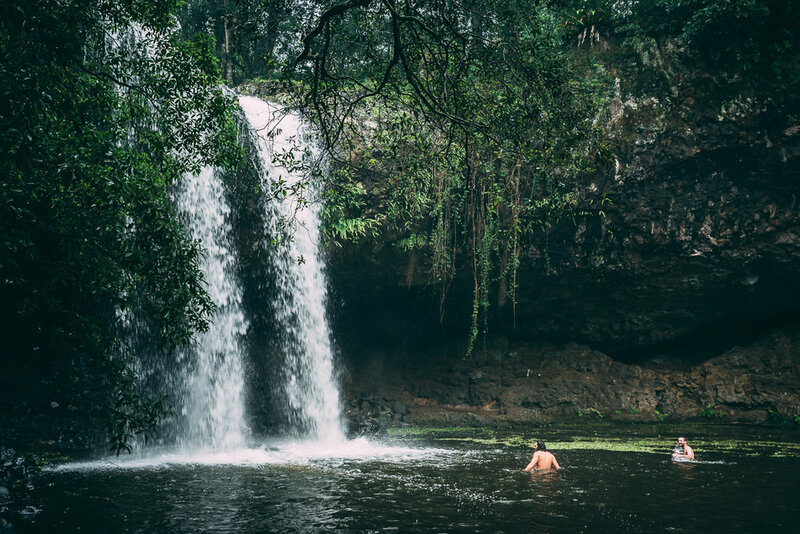 Before starting my business I'd dreamed of taking people on meaningful adventures to explore local gems, get to the heart of what they really want for themselves and their lives and support them to achieve it. 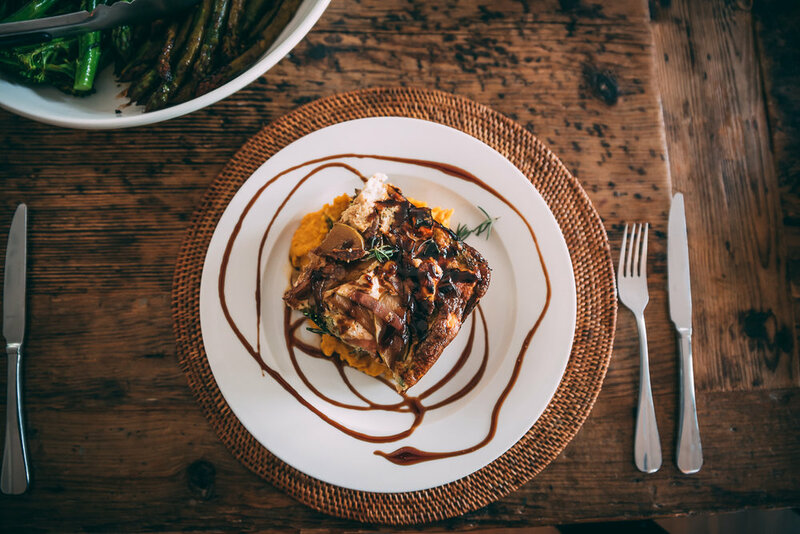 Having travelled solo for years, Tour Guided for one of the largest tour companies and run events all over the world, I felt there was a missing link between what was offered and what people craved & were invited to experience. I wanted to fuse the power of new experiences + coaching to create truly transformative, memorable, FUN experiences with results that last far beyond the initial time together. I couldn't be more proud of EVERY SINGLE THING that we included and how the getaway unfolded. Che & I collaborated for the first time having only met a few weeks before and I'm so grateful for the friendship & experience that came from that heartfelt decision! It's a testament to the power of backing yourself, trusting your vision, and leaping before you feel 100% ready! Deeply valuing authenticity meant it was vital every part of the weekend felt aligned - from the wonderful local sponsors, to the places we went, the women who came to facilitate activities, to where we stayed and what we ate. 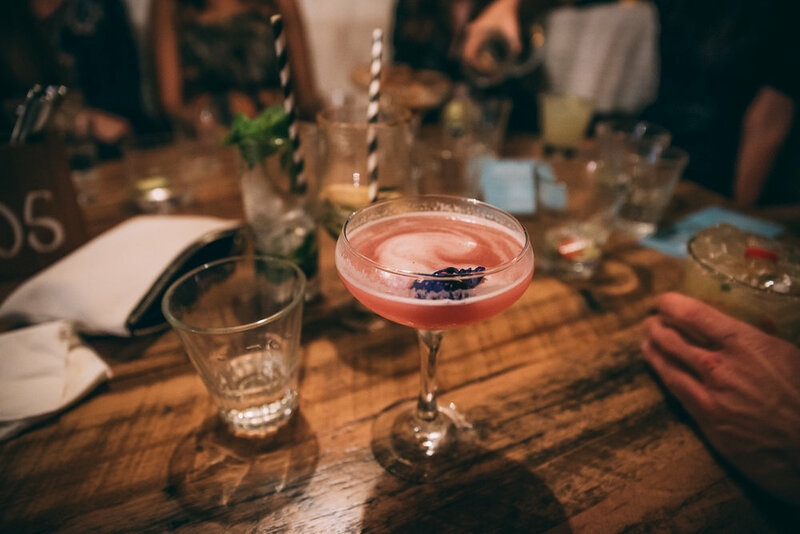 Our Boho babes developed friendships straight away and within the first few hours one of the guys said " I can already tell that this is a safe space for me to open up and really get what I want out of this experience". Sitting back watching these 7 men & women from different walks of life laugh, open up, challenge and support one another to dive deep and dream bigger just made my heart burst! I could feel it was going to be more than we imagined and I wasn't wrong! 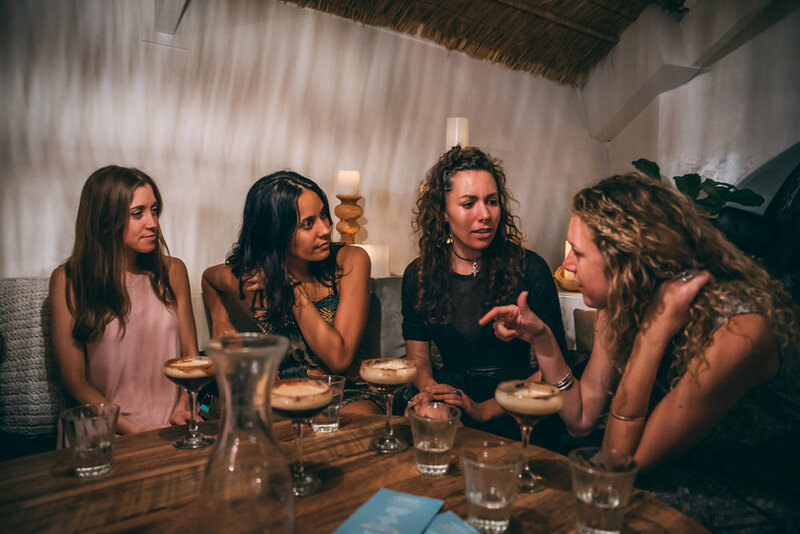 Boho Bliss Getaway was a balance of getting out and enjoying the local surrounds, Desire Map workshops, yoga, socialising at fancy bars, morning beach walks, wine, coffee, great food, guided support, time to yourself, accountability and speaking your truth. 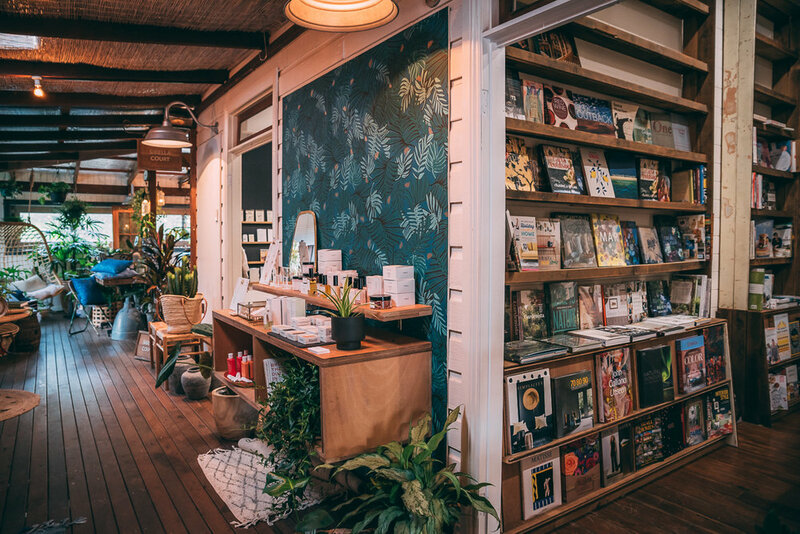 You know how the saying goes... A picture = A thousand words, so here's a couple to highlight the warmth, love, fun & memories of our Byron Bay Boho Bliss Getaway. Our digs. 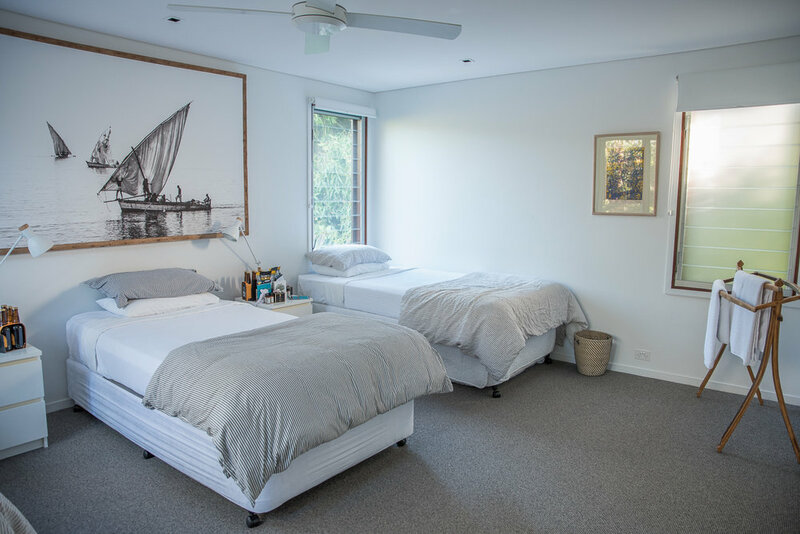 3 story beach villa with it's own heated jacuzzi, yoga deck + paddle boards right across from the famous Pass Beach and near the iconic Byron Bay Lighthouse. We eased into the first day together with a beautiful energising yoga sequence with the talented Meg O'Sullivan and then despite the weather, we set off! Not even the rain could dampen our spirits - there were adventures to be had. 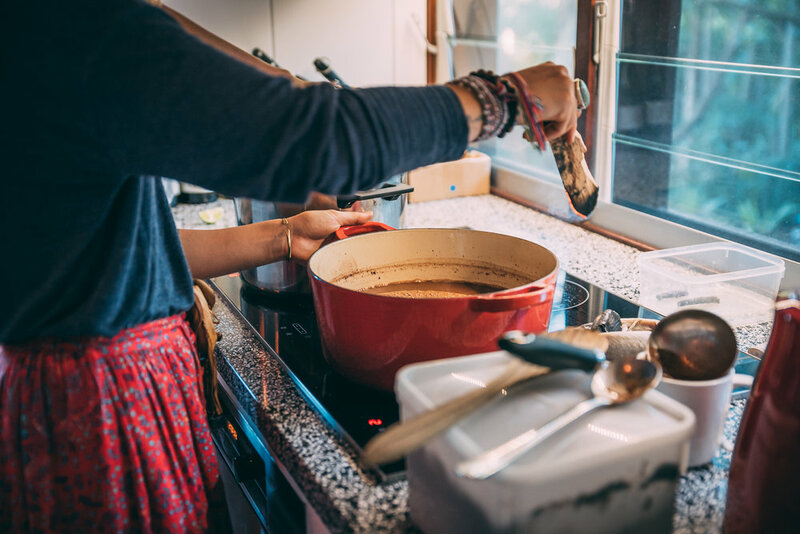 We were spoiled with freshly prepared delicious meals by The Poor Girls Pantry and our guests loved sitting around the kitchen table chatting away as they cooked. 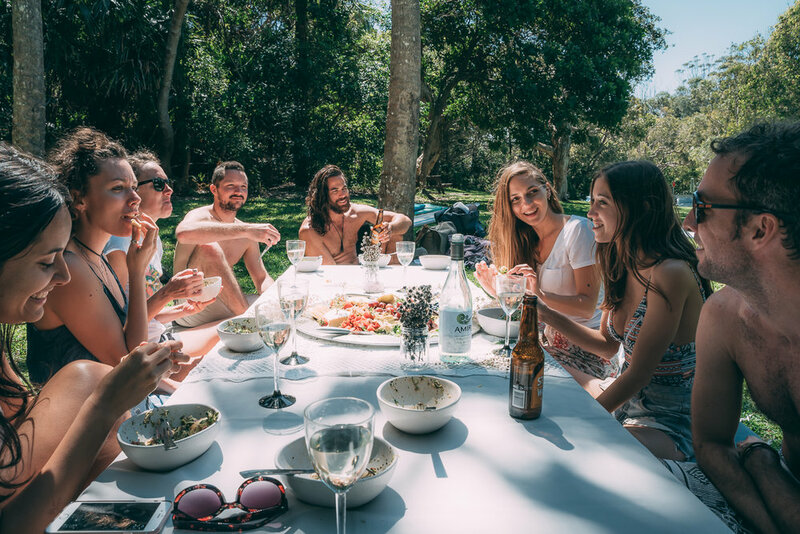 It was often with full bellies and open hearts the guests would spend a few hours relaxing in the jacuzzi, swapping life stories, taking long naps, reading books, surfing, journalling on the beach, brain storming ideas, or reading tarot cards for one another. 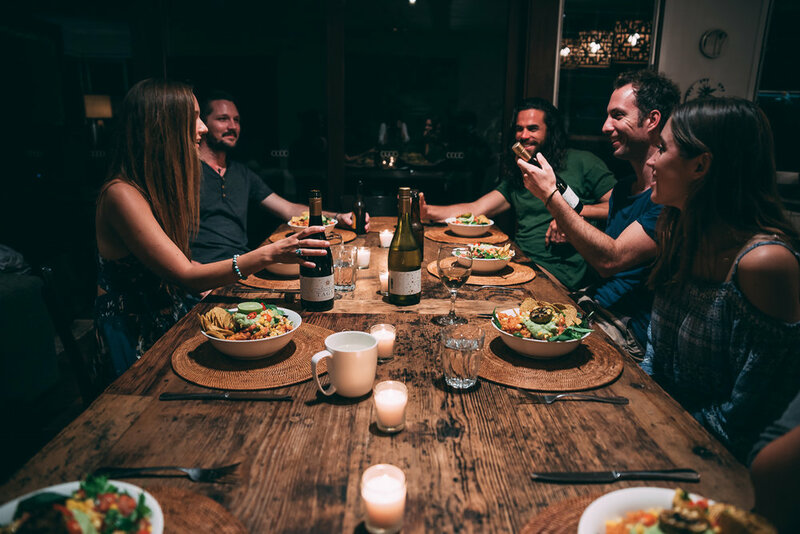 The space felt like a home where old friends had gathered to catch up and support one another in their life's goals - you would never know the group had only come together 24 hours before. Smiles galore. 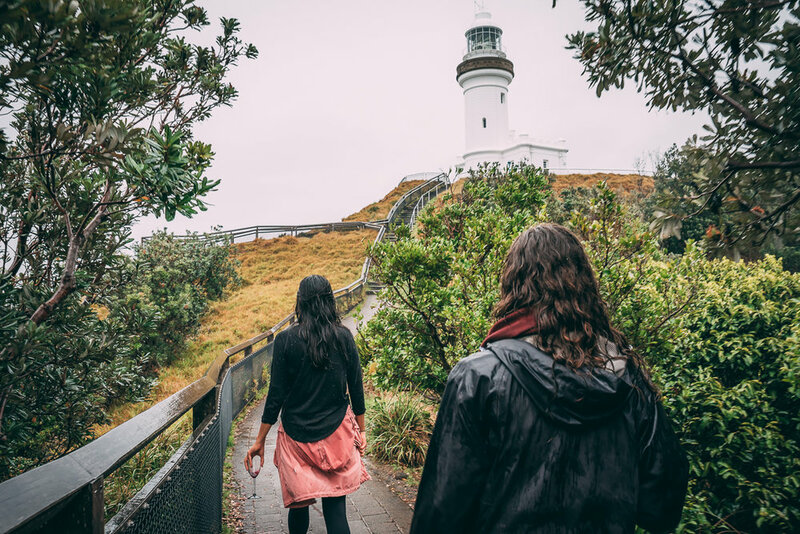 Rainy beach wanders, lighthouse walks + whale watching! 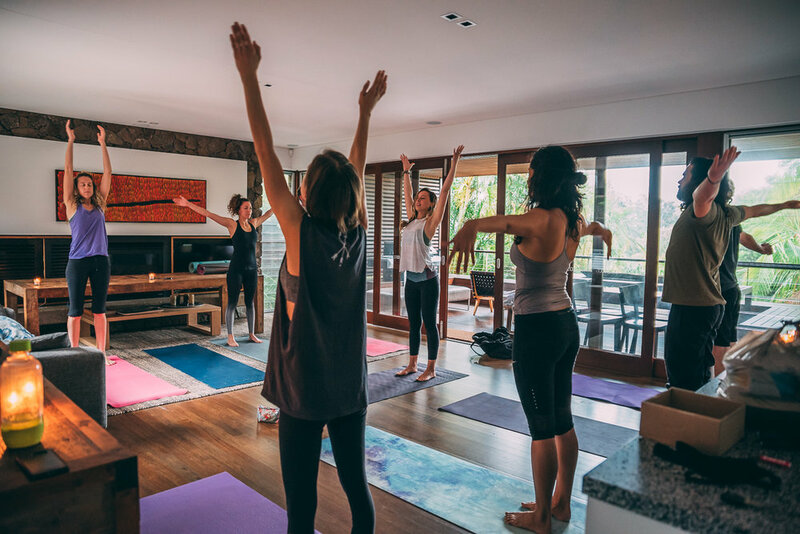 Mixing up intention setting, coaching methods + activities made for a beautiful balance for our guests to breathe, and integrate all they were learning and re-discovering about themselves. Finishing off our final night together with a sacred cacao ceremony was the perfect way to ground, center and connect with Mother Earth. Kristen Graham has spent years back and forth from Peru and she guided us to reconnect and be reminded that we are fully supported and guided on our journey. ( I was very particular about the fact that I only wanted someone to facilitate this activity who truly understood it's origins & significance, not just a cute gimmick ) Kristen explained the meaning behind all the elements and added incredible magic to the space by sharing her love, passion and respect for this ancient Peruvian tradition. Weeks later the guests still talk regularly, share their progress from goals that were set during the weekend and genuinely encourage one another. This was about the individuals just as much as it was about building a community and our guests all left feeling empowered to not only work on themselves but continue to put themselves out there to connect with other humans who understand and accept them just as they are! I don't believe you can really get beneath the surface to the heart and soul of a place if you aren't connecting with the locals. I'm proud to say that Boho Bliss incorporated all locally made unique products and services. Thank you to the beautiful women who cooked, yoga'd, cacao'd and contributed to making this so special. And to our wonderful, creative genius guest/photographer - Stephanie Ranty. I'm beyond thankful to each of the incredible people who joined us, for letting me into your hearts, trusting me and giving me one of the most fulfilling adventures and experiences to date. Some love from our Boho babes! I wanted to have an experience that felt aligned with my soul. Boho Bliss was a great balance of figuring out what your desires are and having a great time living in the moment. I often want to control things and Boho Bliss allowed me to completely surrender knowing I was being taken care of with such a diverse range of things to enjoy. Having people around, who also wanted to better themselves,cheering me on was amazing. I learned so much from everyone and my biggest takeaway was that anything is possible. That as long as I’m passionate about what I’m doing I can basically do whatever I want and to just trust in the process.